Home Addons How to: Approve a Post using PowerSocial 1 person is discussing this now. PowerSocial allows Dynamics CRM users to post messages on LinkedIn or Twitter, all from within the comfort of their own CRM system. It’s as easy as choosing a publisher, creating a message, and posting! But, of course, not just anyone can post using PowerSocial. 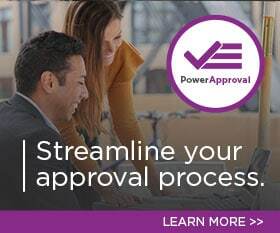 PowerSocial also includes the ability to require approval before posts are blasted out into the wilderness of the social media sphere. PowerSocial also makes it easy to keep a consistent flow of messages going out, by allowing users to schedule messages to post at a specific date and time. With PowerSocial, you can not only post from within your CRM, but you can also monitor specific people, hashtags, groups, companies, etc., plus you’ll be able to turn incoming messages into contacts or leads, and respond to posts or repost from within CRM. If you are a social media nut, PowerSocial is the add-on for you! A user may have rights to read and create posts, but only the PowerSocial Admin, and those given extra field security by the PowerSocial Admin, can actually post without needing the post to be approved by the PowerSocial Admin. There is a view to see all unapproved posts. 2. Navigate to Social Posts. 3. Select the Drop-down arrow next to the currently displayed view. There are many other views that come with the PowerSocial add-on; these views will be accessed the same way that we will choose the view to approve posts. From the Drop-down, select Needs Approval. 4. Once on the view, open the post that is to be reviewed for approval. As the PowerSocial Admin, the details of the post may be edited. Do all edits before you check the box and save. When everything is all set, to approve the post, check the Approve check box and then hit Save in the lower right corner. The post is now approved! Happy posting! Thanks for your interest in PowerSocial. Should you have any questions, contact us at 612-339-3355 or email powerpackpro@powerobjects.com. Remember, your trial will expire 30 days from the date of installation. If you are interested in subscribing, go back to the configuration screen and change “try” to “subscribe” and enter your credit card information – you will be charged $1/CRM user/month. by Joe D365	March 11, 2015 1 person is discussing this now.